After the research on the stock i would like to cover into our Small Cap Coverage segment for a target of 100 in long term which is a good 50%. A strong investment pick for patient investors.Will try to post the fundamental view later in the weekend. Looks like the stock may move Autoline Inds. Disclosure: Lokesh Machines has been recommended to our Delivery Gains clients ! Dhunseri Tea covered at 175-195 has given a breakout and should head to 250 in short term. 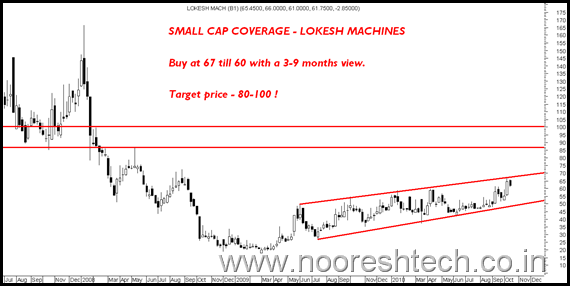 Thanks for the suggestion of Lokesh machines. I want your views on Pondy Oxides. I hold the shares @36. Is it a good investment and how long can I stay invested? Pondy is a good stock to hold for long term. thanks for Apollo Hospital pick, can you please comment on Spice Jet for mid term? I have one query, what is your view on DFM foods and Jagatjit Industries for 3-6 months horizon. Is it a buy at current levels? please put some light on LNT. will it move to 2500??? It wud be too far-fetched to expect 2500 for now but in more then a years time yes.